I frequently get emails from great readers who have seen something on FTW, tried it themselves and have been kind enough to share their results with me. 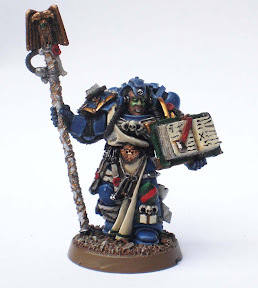 In this case, this post comes as a result of a reader who tried the glowing eyes effect originally seen in this post here and wanted to know what he could do to improve the effect on his model. What follows are the notes I sent him concerning his model (the Librarian here). My first impression of the effect is that it doesn't read as "glowing," but instead looks more like warpaint. Trying to figure out why that was, I took a closer look at the face of the model and came up with 5 key things that affected the end result. 1. The eyes themselves. Very nice. They are the brightest spots (almost). The cheeks appear to be just as bright, but that may be the lighting doing that. This is key to showing the viewer what the light source is. The dark lines around them is not a problem here either. Try and keep it a thin as possible, but it doesn't detract in this case. 2. The nose. Again, great work bringing the glowing light out onto the sides of his nose and not the front part of it. This helps define the nose and the face and the source of the light all at the same time. You also do not have the dark line at the edge of your glow here which makes the transition from glowing color to regular skin color almost perfect. This is very important and brings us to the next issue. 3. Here is a problem. You have a natural shadow on the face, but it starts to look like a dark line around the edge of the glowing area as it comes out along the side of the cheek and that kills the effect. You did it perfect on the nose, but here is no good. This contributes to the warpaint look. And the glow comes down a bit too far on the face to be associated with light from the eyes. You have to keep it up top on the upper part of the cheekbone. 4. You're missing some glowing light here. The glow will come out in all directions. In some places it will come out further than others, but it is missing completely here. Again, contributes to the warpaint look. 5. This underlighting is very nice. Again, it's that lighting that comes out from all directions and this really helps. In order to show him what I was talking about, I took the same face from above and did some "correction" to it. I'd like to thank him for sharing his work for the rest of us to look at, dissect and learn from. It's when we open ourselves up and look at our models with a critical eye that we get the most from them. Great post. This is can be a tricky thing to get right (my own attempts have been pretty hit and miss). Describing the corrections and showing the before/after is immensely helpful. Have to echo that, great post Ron. Thanks guys, but the real credit goes to the original painter who agreed to let me show his work here as an example. Ron, I'm glad you put my work to good use in the blog. I think that sometimes seeing things done wrong can be as helpful as seeing work done well! I know its helped me already. I'd add tiny spots of green on the metallic parts over the ears and on edges of helmet - to further indicate the glowing effect. 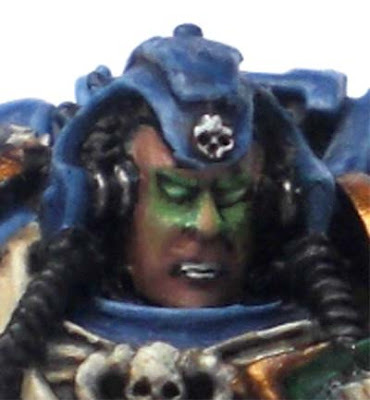 I agree with lehcyfer: a few hints of green along the surfaces facing towards the eyes can really add to the 'cast light feel' you're after. holy cow, that is neat and adds immediately to the miniatures. Well done. Combat Apoth: Thanks for allowing me to share this. And I think the addition of a few select highlights on some of the metal would definitely help. That's some advanced stuff there though.